I am continually amazed at the ways I find to avoid writing. I am supposed to have the whole day today to write. I’ve even blown off a family get-together and a write-in to be more productive. And what do I do? I take a four hour nap get up and for some reason start looking for a new hat. 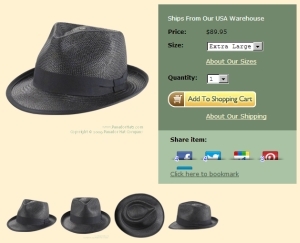 Yes for some reason I suddenly really need a new panama hat. I did finally find a black one I really like. You know it is hard to find panamas in any color than white and white is just not my color. Not only did I find a black one, but it is Havana style. Just what the mature budding southern writer needs to look snazzy while he is working on his delusions, aha, dreams of becoming a published author. Of course it is $90. I don’t have $90 to spend on a silly hat, but damn it is a nice hat. I certainly don’t have time to be blogging about looking for a hat I don’t need instead of writing. I mean for gods sake, my main character just got shot. He has to get to the hospital, he has to hear the bad news about his high-school lover and what will happen to the kids? I don’t know I have to write it! Hysterical! Your character gets shot? Oh my! I guess both our main characters had a bit of a rough weekend … Get the hat!